Posted 5/12/12 – People often wonder about the details of emergencies and how what appears to be alternatively complete chaos or inactivity results in anything being accomplished. Like many emergencies, search and rescue operations are exercises in problem solving in often difficult circumstances. Many people are familiar with the more typical missing or injured hiker incident at Chantry Flats. 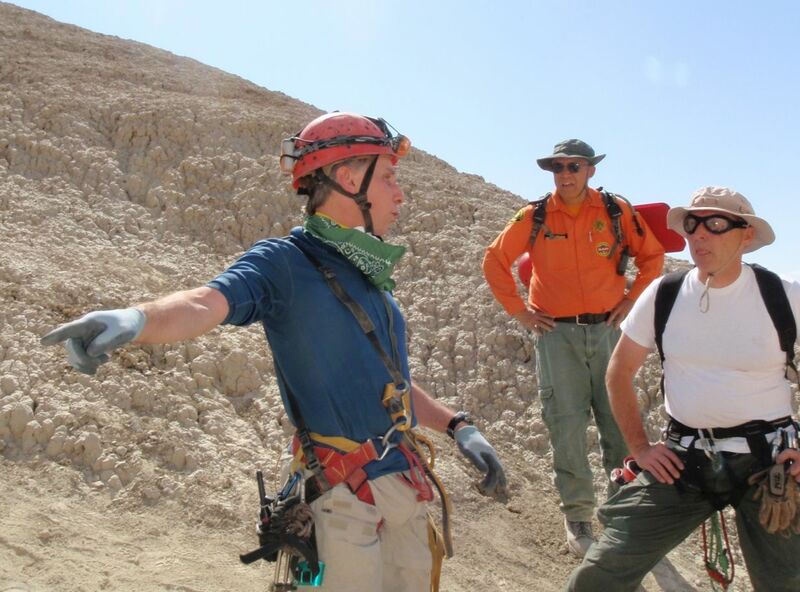 This is a bit of insight into a more unusual operation, the recent body recovery in one of the Arroyo Tapiado mud caves in Anza-Borrego State Park. Guillermo Pino’s body had been located at the bottom of a narrow, 30’ deep pit in one of the Arroyo Tapiado mud caves. As a result of having participated in search efforts in April, rescuers were familiar with the challenges that would be faced. Art Fortini of Sierra Madre Search and Rescue was tasked with leading the underground rescue effort last Tuesday. Joining him were two additional members of the Sierra Madre team along with members of the Montrose Search and Rescue Team and the Los Angeles County Sheriff Department’s Emergency Services Detail (ESD). Years of collective experience and training were immediately put to use assessing the situation to weigh the risks of any recovery. 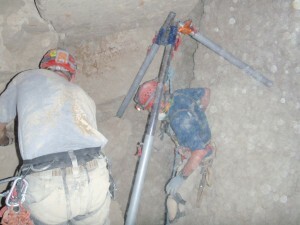 With those risks in mind, and armed with information gathered during the previous day’s efforts by the San Bernardino Cave Rescue Team, rescuers assembled outside the cave and formulated a set of primary and alternative plans to remove Guillermo’s body from the crevice in which it was wedged. While work was underway to implement Plan-A, another of the Sierra Madre rescuers, Barbara Fortini, heard noises in the ceiling at a level below the side passage. She indicated that there were two ceiling “leads”, a passage that has not been explored, from which the noise was coming. Rescuers rappelled down to the lower level to assess the 2 climbs. Art reported, “The first lead was rather dicey, but I managed to get up, squirm through a tight upward angling passage, into a tighter horizontal passage, and poke my head around a corner. I saw Guillermo’s feet about a yard away through a 6” wide crack.” Checking the other lead he found that the climb was easier, and it too enabled me to see Guillermo’s feet through an even narrower constriction. Rescuers now had 3 options for accessing him. “When word got to the surface that we now had several options for recovering Guillermo, the mood in the CP underwent a palpable change from near hopelessness to guarded optimism.”, reported Fortini. Lumber was brought into the cave to create a safe working platform for accessing and digging in the first ceiling lead. The smallest team member widened the initial passage allowing SMSR’s Jon Pedder to enter the passage and continue the effort. Rescuers ascended their ropes approximately 25’ back up to the upper level (the Plan-A location) and started digging there as well. Eventually, rescuers were digging at all three locations. Thanks to the convoluted, 3-dimensinal nature of the cave, rescuers could work without risk of dropping debris on each other. All of the digging to this point was done with simple hand tools, which minimized vibration and risk to the rescuers. The walls of the two ceiling leads were rock rather than the easily-removed siltstone. Like many aspects of search and rescue, this proved to be a two-edged sword: it made the passage widening efforts significantly slower, but it also eliminated the need to install shoring. Work to widen the ceiling leads took several hours. Once the two ceiling leads were sufficiently widened the medical examiner entered the cave to examine the scene. “We then widened one of the ceiling excavations a bit more and used a rope system to lower Guillermo’s body to the lower level of the cave. He was no longer trapped.”, noted Fortini. Guillermo was now free of the confines of the crevice and rescuers could begin the next phase of the recovery effort: moving him through several hundred feet of tight, serpentine passage filled with many, many hairpin turns. It took roughly 2 hours to get Guillermo out of the cave by literally moving him one or two feet at a time. By about 8:30 pm, Guillermo Pino’s body was brought out of the cave. The Los Angeles County Sheriff Department’s Underground Search and Rescue Team is a composite team made up of members of the Sierra Madre, Montrose, Antelope Valley, and Malibu search and rescue teams. The group is one of only a few certified mine rescue units in the state. Team members serve as civilian volunteers or Reserve Deputies on their respective teams. The search and rescue teams are specialized resources that can be called upon to respond to incidents anywhere in the state.